"I feel honoured to share my commitment to making a stand for social justice. I was born and raised in Pakistan. Within this society, I have observed and learnt discrimination against gender preferences, gender roles, disability, mental illness, discrimination and religious intolerance. I had always been of an altruistic nature, and during this period of my life I realized social work, as a career, would allow me to practice altruism on a larger scale, gaining emotional gratification. I stood for equality which means a fair distribution of each of the capacities and treating everyone equally, especially in rights and opportunities. In March 1998 I have started a charitable, non governmental, human rights Organization named HOPE Worldwide-Pakistan (Humanitarian Organization for Poverty Eradication) for the rights of women and disabled people in the society. HOPE's work broadened and the organization became one of the human rights organizations in Pakistan. I migrated to New Zealand in 2008. Changing to a new country and different culture was a big challenge for me but my passion to help underprivileged people didn't stop. I learnt about the NZ system, gained qualifications and now I am working with Disability and Mental Health Services, with individuals who have intellectual disabilities, challenging behaviour and mental illness, to make positive changes in their lives and to participate in their communities. The job entails working alongside a multi-disciplinary team like social workers, mental health practitioners, psychologists, occupational therapists and nurses. This opportunity has greatly improved my skills and has given me a valuable insight into this field. HOPE Worldwide-Pakistan was initially established on 23rd March 1998 in Pakistan with a mission to uplift, support and speak for those who cannot speak for themselves. HOPE started to work for women empowerment, child education, and youth empowerment. By 2004, HOPE's work scattered and recognized at local regional and at international level. As we all know that Pakistani Christians always been treated as third class citizen in Pakistan. It became much harder for Christians, when Pakistan's late military ruler Mohammed Ziaul Haq, introduced 295 BC in country's blasphemy law in 1986. Since then Blasphemy law has been misused by fundamentalist Muslims where they use this law as a weapon against Christian to persecute. In the result of misuse of law there were range of attacks on Christian minorities and many houses, churches and colonies were burnt and Christians are living a scary life. However HOPE was a small organization but being a Christian leaders and Lords soldiers we jumped into and started Free Legal Aid and Awareness Protection Program (FLAAP) in 2007 to provide legal aid to falsely accused victims. In 2008 HOPE was supporting victims and organized a campaign "TO stop misuse of Blasphemy Law". In 2011, alongside with our Christian brothers and sisters here in New Zealand we have organized successful campaign "To stop killing innocent Christians in Pakistan and to stop misuse of Blasphemy Law in Pakistan. In 2013 when we have received further information about people fleeing to Thailand. This was the time we came to know more about these stranded asylum seekers and refugees in Bangkok. We took initiative and started Bangkok Asylum Seeker Support Program. Under this program, we helped and are still working with families those been persecuted in Pakistan and now suffering and stranded in Bangkok. In October 2016, group of like minded people gathered and came up with an idea of re-establishing an organization for the betterment of people and agreed to carry on working for this Godly cause but as more structured. 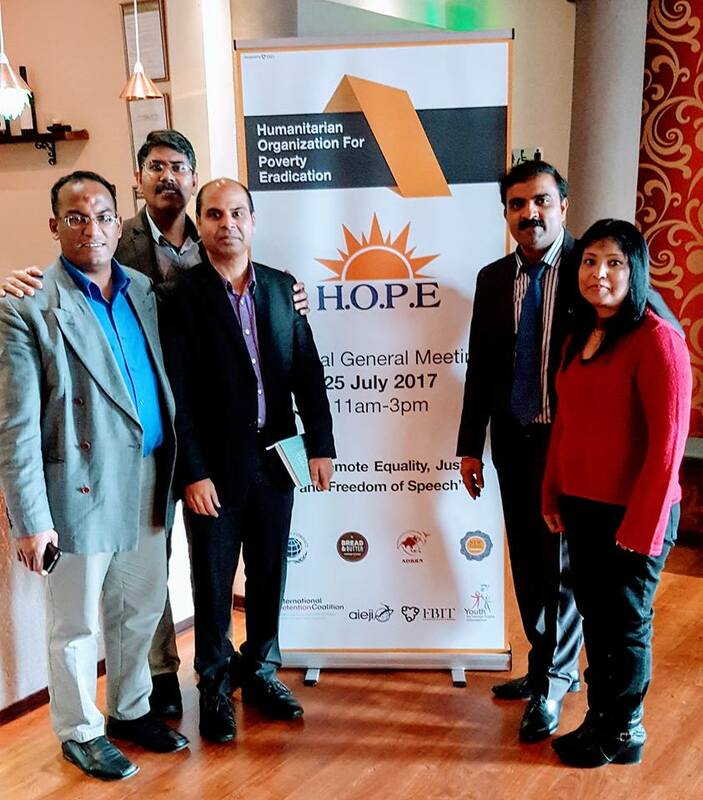 Finally, HOPE Worldwide-Pakistan has been formed in New Zealand with its mission to promote and safeguard the fundamental human rights of vulnerable groups whose lives have been traumatized by disasters, poverty, persecution or discrimination. Transforming lives by acknowledging people's strengths/needs and walking alongside to improve livelihoods have been always main core purpose of the organization. HOPE seeks to go beyond addressing the consequences of poverty by understanding, challenging and changing the environment that causes poverty and exclusion."